At last an affordable solution to protecting submersible pump motors from dry running, electrical overload and over voltage. 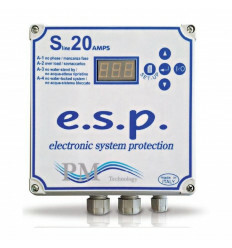 The ESP (Electronic System Protection ) is available to suit single phase and 3 phase submersible pump motors. Three phase versions also protect against phase drop-out. Ideal in rural areas or where water bores do not provide a guaranteed constant flow of water. Pump operation is automatically restored after a selectable 10-20-40-80-120 minutes. This is a another quality product manufactured by PM Technology in Italy. All settings are done via front touch and a digital display. E.S.P. is available as three-phase and single-phase version. It is also supplied with a digital auxiliary input to start or stop the pump. A float or a pressure switch can be connected to this input. Available .37kw to 2.2kw in single phase versions and up to 11kw in 3 phase versions. Bore running out of water? To help protect your submersible bore pump motor from running dry and from electrical overload ask us for more details on the ESP control box. We carry local Perth stock and can ship Australia wide. The ESP control box is designed to protect your pump from running dry by stopping the motor when a low current draw situation is present. The unit restarts the pump motor when normal condition is restored. The controller will also help detect and protect against dead heading of the pump caused by incorrect irrigation design and solenoid valve failure.